Times are interesting for sure. Is there any more fuel for stress today than there was last year, last decade, or last century? Who knows? We don’t compile that data. Not here anyway. One thing for sure, the more stress that gets expressed, expanded and elevated, the more seems to show up. For example, putting aside the incidences of terrorist attacks that seem to have become a part of living in our modern world, the amount of random acts of violence for the most innocuous reasons—a relationship breakup, being cut off in traffic, a layoff—have seemed to rise. Or, is there simply more tension in the general air that have those events just catch our attention more? Either way, left unchecked, tense times appear to bring about more tense times…for each of us individually and the world as a whole. I recently noticed that the political climate has had my “guard up” for the last several months. Even though I believe in my mind that I can separate the mood brought about by this climate from my work, my relationships, and my being and interacting in the world, I realized that I’m fooling myself. The general mood I find myself in in one area can’t help but put a pale or cloud over another area. We’ve all heard that “Wherever you go, that’s where you are.” So, realizing that bracketing or separating out the moods in one area from others won’t just happen on its own, I’ve become more vigilant about stemming the tide of tension. We are living in times of high-potential stress. It’s what we each do with that potential that makes a difference. The potential either gets expressed, or it gets transmuted by our individual efforts. Given that muscles are only built from resistance, perhaps this is a perfect time to build muscles around stress…because the world’s resistance to being at peace is all around us. We can either add to the escalation in our responses and reactions, or peacefulize events and environments through intentional workouts. We seek to do that each week here, in our Back Forty messages and efforts. What messages can you send out today, whether initiated or in response, to turn the tide toward peace? Here’s a few ideas to help you Peacefulize in a Stress Test. First, it’s important to just notice the resident vibe in which you’re operating. I say “resident” because it kind of lives in us. It may be an unwelcomed visitor, but if it’s a negative vibration that snuck in and is living in your basement, it’s smelling up the whole house. So, first, begin to notice what’s lurking in the unseen. Are you irritable? Are you punchy? Are you easily rattled or thrown into concern or argument? Notice how you respond to the natural flow of life each day and see if you can be an observer to yourself. Is that person happy and content, from an observer’s point of view, or might they have something going on behind the scenes or under the hood? Get good at noticing your resident mood…and what might be going on that has you in that mood. Have some empathy for yourself, realizing that you’re not wrong for any reason you may be punchy or irritable, and understand that most people would be operating the same way you are. You’re only human, and stuff happens that throws the majority of humanity into fear, concern and stress. Realize that you have a choice, each and every moment, as to how you’ll be. Will you side with the majority, and be the average person handling stressful times in an average way, being just as argumentative and committed to being right as the next person…or will you be different? Look, you’re not “right” for choosing to be different, for choosing to find a different way to operate than the majority, but just realize that you do have a choice. If you do happen to be one of the minority who choose to take the road less travelled, find ways to bring peace instead of more dissension and tension into every event or environment in which you find yourself. General tension in the air means that most people will be at a heightened level of blowing off steam. See, in every situation, how you might be someone who cools down the steam so that, as water, it can flow easily down the path of least resistance, which water tends to do. 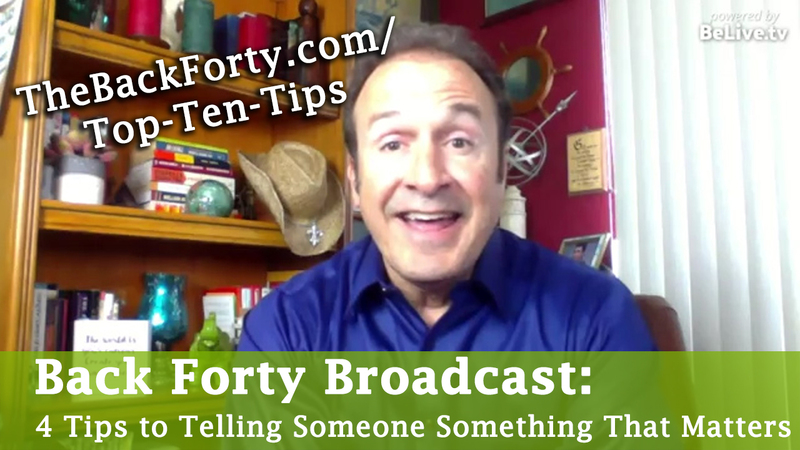 Sure, “count to 10” if you need to resort to basics…but, beyond that, how might you serve yourself and others by bringing out the possibility or perfection of every situation vs. buying into the problem that everyone else will be focused on? Be inventive. Be creative. Be different. If you’re here to play a yet bigger game – no matter what you’ve accomplished thus far – it will take you being different than the rest of the crowd and bringing out ALL of you in a NEW way. 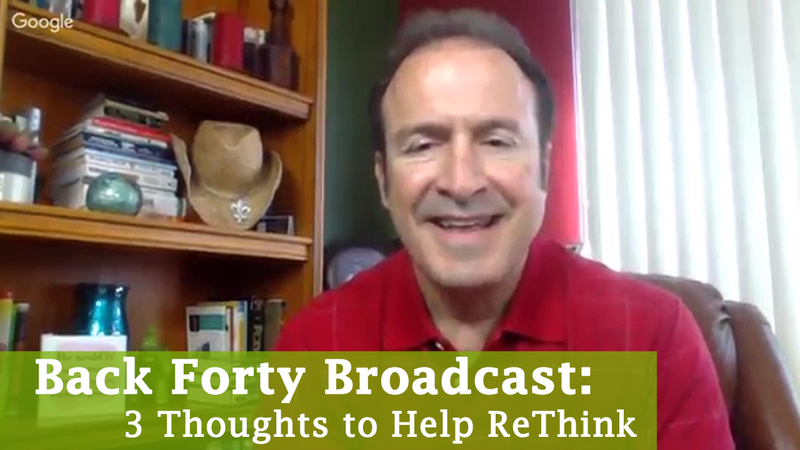 We created The Back Forty Re-NEW-ALL Program for just this reason: to support you to go against the grain of how the majority would view challenges and potential stresses and actually have them serve you to be who you came to be and do what you came to do. Those “stress tests” are really your best friend, helping you get there, if you approach them powerfully. There’s two different cuts we can take at stepping back. The first is when we revert to the comfort zone in the face of the challenges and contortionisic stretches required to play bigger, express broader, and adventure into new territories. The other is when we move away from the machine so as to get a bigger picture than the next rung on the rat wheel. We can all fall prey to working in our career vs. on our career, in our business vs. on our business, awash in our life vs. perspective on our life. For example, it’s great to have that current job or business, especially if you love it and feel your highest self-expression pouring forth. Yet, we all know that nothing is guaranteed and, according to standard business wisdom, if you’re not moving forward, you’re moving back—there is no standing still. Also, there may be personal or business practices, tried and true, that we engage in without thinking anymore of whether they are working. 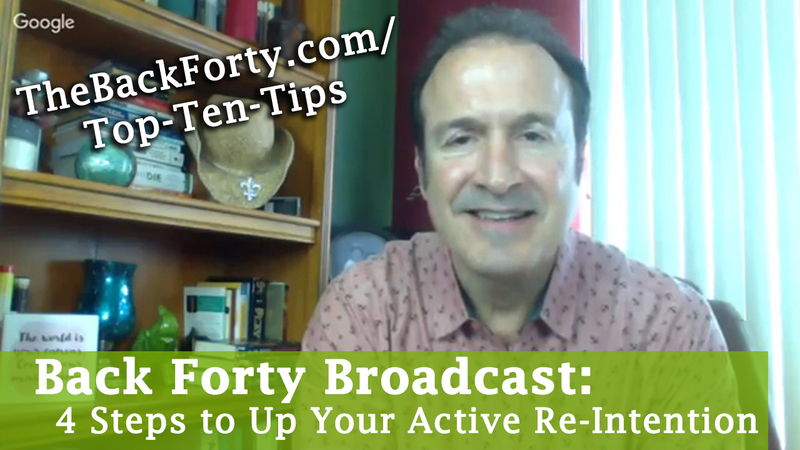 Therefore, stepping back from the activity to get the bigger picture is a wise, forward-focused practice. The same goes for the progress forward of our relationships, health, finances, personal mission and overall sense of well-being. Nothing stands still. It’s forward or back. Alexandra (my partner in Back Forty crime) and I recently took a 911 weekend away. We cancelled all appointments and booked a last-minute hotel and unplugged, unscheduled, and unwound. 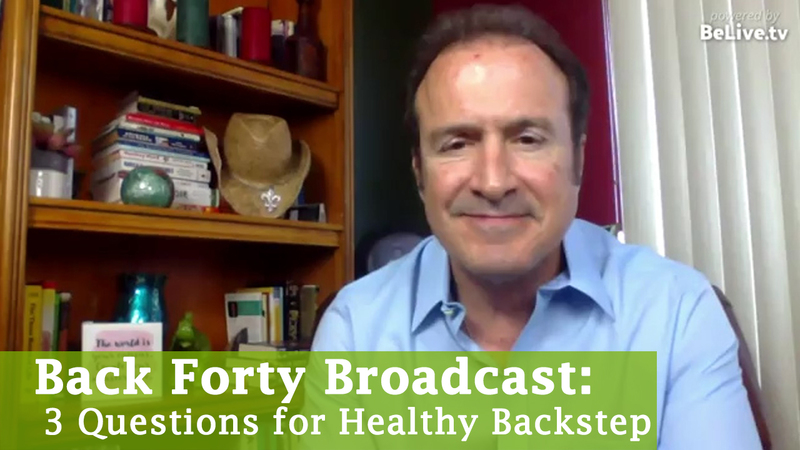 Yes, we relaxed, and yet we began some meaningful (but not significant) conversations about how we want to design our Back Forty from the long-view perspective. That weekend, and the inquiry thus begun, has produced ongoing ripple effects which have shaped our consistently upgraded views on many aspects of our work, mission, and enjoyment of life. Good thing! We figure that, with us being the forerunners, scouts and pioneers of creating a radical second half of play, passion and purpose, we are to live it to prove it’s possible! From the bigger picture, all of us can see what’s working and what’s not…and put in the pieces we don’t see when up close and personal. Incorporating healthy backsteps into your dance, to catch that bigger perspective, can make for a far more workable final choreography. Sometimes, it’s necessary to look at the State of the Personal Union to see if how we’re living, how we’re working, how we’re relating is actually sustainable over the long term. Sure, there are some crunch times in everyone’s life. Yet, you can’t really sustain crunchtime. Over the long term, you tend to get crunched. Consider the impacts of machines running on High all the time – they wear out, burn out, or at least don’t perform at their highest productivity. Is the career, business, life you’re running safe and sound at the pace or peace it’s going? Is it worthwhile to re-evaluate and re-frame what’s really important and what’s really working (and what’s not)? We may think, at first blush, that everything is tied with a bow as it is and there would just be too much upset caused by rethinking and reorganizing the pieces. Yet, that’s simply not the case. Were something major to happen in your world today, truly, all bets are off. So, what can we let go, mix up, or do differently? 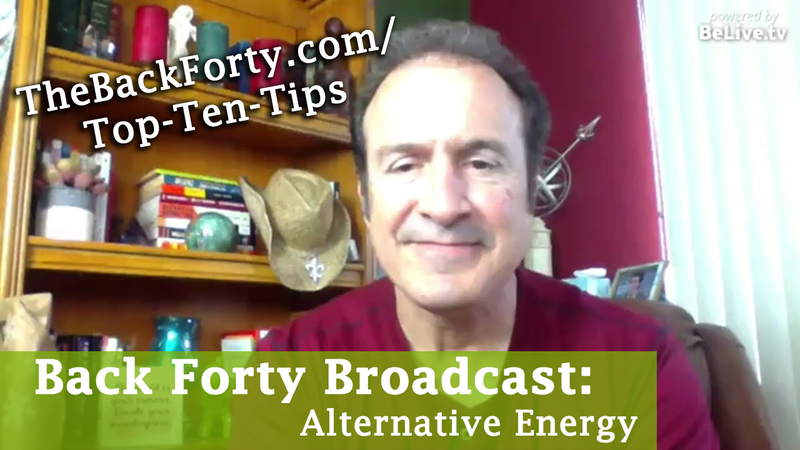 Today’s Back Forty question is: where can you step back from the trance to enhance the workability of your own dance? What if A didn’t necessarily need to precede B…or what if there was a way to get to Z by circumventing the linear alphabetic song. In other words, we often set up rules in our minds as to “the way things need to go” in order to get from A to Z. And, by establishing such rules — consciously or (for the most part) unconsciously — we create a reality. Change becomes prescribed to take place a certain way. We often can’t imagine a result we’re committed to having in our life, our career, our business, our relationships simply showing up. That’s what’s called “magical thinking,” and we all know we have to work for it. So says the industrial mindset, and we can all agree that simply saying it or waiting for it doesn’t have it appear. And yet, somewhere within that rigid and calculated “truth”, if there were the slightest crack of radical possibility that things may not be so fixed as how we see them, what might have a chance to happen outside the rules? There are philosophies that say the results that come to us are not so much a function of what we are doing as who we are BEING: the general outward expression of our most deeply held truths. There are yet other philosophies which tell us that it is the thoughts that we hold predominate in our conscious mind which attract to us our experience. Plus, we all know that those thoughts we hold in our SUB-conscious mind are huge factors or culprits in our life, depending on what we’re attracting. Let’s not throw out our earnest-strategy babies with the bathwater. Coming up with our plans and directions to pursue are healthy and give us confidence (e.g., “If you fail to plan, you plan to fail”). Yet, perhaps there’s value in making room for unexpected and unforeseen fortuitous factors to creep in. Pick an area of your life where you’d like to see results you’re currently not experiencing. Is it in the area of relationship? Maybe dating? Or how about the area of career? Look to see what “rules” you’ve created about the way things need to go in order to have that result. For example, I need to be on 4 dating sites and go out with 3 first dates each week. Or, I need to get my resume in perfect shape and then start looking for openings by reviewing online job boards. Just look beneath your assumptions and outline the steps and processes you believe must take place for it to happen. Begin to ask yourself some simple questions that take you outside of those rules. What if I were to get a call today from a friend who wanted me to meet someone? What if I actually looked around me today and created some casual conversations? What if I were to hear about a new company or meet a new person who turned me onto to a new opportunity? Seems simple, but we don’t often just allow ourselves to ponder what it would feel like if what we seek were simply to come. Allow yourself to keep doing what you think you need to do, yet allow yourself also to expect the unexpected. Simply seeing how our rules have blocked us into a reality that must seemingly go a certain way can allow the unforeseen and unexpected to arise. Here’s the big question: what do you have to lose by simply pondering some what ifs outside of your rules? “Waiting to exhale” is a phrase many are familiar with, if not from the movie of the same name, just the experience of life as lived. Stressful events in our lives and the world can cause a virtual breathing disorder. Though any change is always, at first, discombobulating, in The Back Forty we offer that any “crisis” can also be seen as an opportunity. Yet, while in the midst of the crisis-come-opportunity, we do need to stabilize and get grounded. In that process of getting back to basics, the most basic of basics is to remember to breathe…into the apparent disorder. 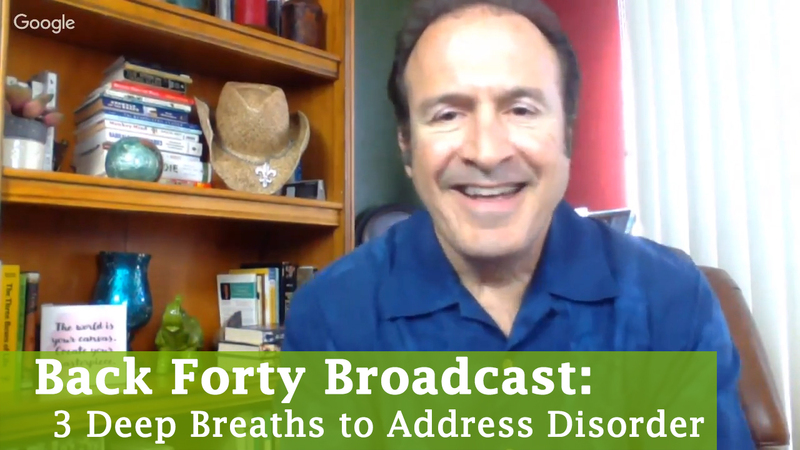 We don’t often regard the practice of breathing – whether it be literally, or figuratively (e.g., stepping away from everything to gain perspective) – as a first-blush consideration in living life. Yet, too often that invisible or unappreciated practice becomes highly regarded after a scare of one type or another. I recently wrote about the opportunity to invent reasons to stop ourselves and breathe before something else stops us (health scare, relationship upheaval, financial sideswipe, etc.). If we subscribe to The Back Forty belief that each of us has yet to do what we came here to do, then that means we want to take the long view…because we’re ideally going to be around for a very long time. So, whatever it takes to focus on breathing – literally and figuratively – into whatever disorder we stir up in our purposeful pursuit of a second half of play, passion and purpose is worth every last minute it gives us…because it may be that last minute of this life when we accomplish what we came here to do. You can’t help anyone in any worthwhile way unless you have applied your own oxygen mask first. First and foremost, be sure you’re getting the rest, nutrition and mental relaxation necessary to keep coming at your work, your life, your world with the highest functioning of your full faculties. There’s a phrase that says, when things get a bit crazy, HALT: never get to Hungry, Angry, Lonely or Tired. There are many phrases from many cultures which say the same basic truth: things will look different in the morning. Realizing that, if we give ourselves the self-care to step back for a moment, a bit of rest and NOT thinking about the issue at hand can actually open up new perspectives from which can then be seen new actions to take. Take a breather from the urgency of the moment. Step away from the machine. Actually realize the blessing of the fact that you are, right now, in this moment, breathing, with the health, and ability, and food in the fridge, and people who really do care all around you, and opportunities to contribute…all right now available in the present. There is a next step. This is a life to be lived. There is something yet to unfold to have you be who you came to be and do what you came to do. And you need to keep breathing to get there. The tendency is to do, and do, and do…and keep doing until done. Our cultural work ethic values pressing forward and figuring it out, whatever it takes. There’s a lot to be said for pressing forward, yet especially with an easy touch. When the chips are down, we often go head down, nose to the grindstone and get so tight that we only breathe in. We forget that tight means no openings for entry…for new ideas, innovative approaches and, God forbid, playfulness. Literally, I can see myself having two completely contrary personalities at times. When in a relaxed state of playfulness and connection, I can attract play partners like the biggest magnet on the planet. Yet, when I’m tightly wound, trying to figure out through smarts or strategy the best ways to go, often the flow stops…as well as those wanting to be around me. Winston Churchill, a man with the fate of the world on his shoulders, painted to open his mental creative faculties for battle. Thomas Edison, one of the greatest inventors of all time, was an avid fisherman–with no bait because he wanted solitude and inspiration, not fish. Researchers have discovered that people exhibiting relaxed playfulness appear to be better at coping with stress, can easily see things from new perspectives, and are more likely to report leading active lifestyles. It’s in those moments where it really counts that our exhibiting such playfulness has its greatest impact. Yet, in those moments, a playful attitude just doesn’t make logical sense. The gold is in the contrary action. In our second half, we can become rigid in how we have forced things to happen in the past. As Monty Python says, “and now for something completely different”—becoming playful—can feel different, and yet far better for our long run of doing what we came here to do. So, the next time the tight wad of forcing an outcome wraps you up, contrary action such as loosening your grip may save the color in your knuckles and even incite some chuckles. Laughing and relaxing in the face of challenges and tribulations may be the smartest strategy to play. 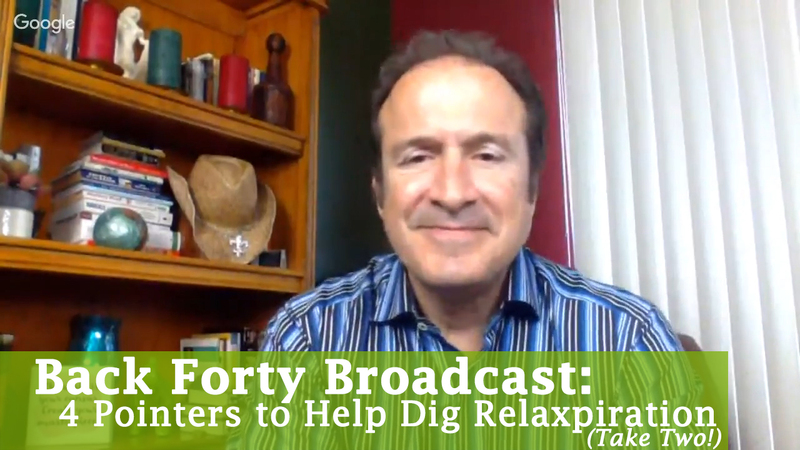 Here’s a few pointers on how to dig on relaxspiration. First, you have to get really good at noticing the tightness. Start feeling your body when you’re doing what seems relaxing and easy and then compare it to times when you’re in the heat of forcing something to happen. If you’re so tight most of the time that a piece of charcoal could turn to diamond in your presence, it will be hard to for you to see it yourself. Do a tightness survey with your friends. Find out how they’d rate you on a scale of 1 to 10 in terms of diamond mining. Notice the worldly weight of the moment, when everything seems to hinge on the answer, the path, the route to take absolutely needing to be on the table hours before. When there’s no time to waste and every slight delay or challenge meets with irritability and a few choice expletives, just ignore the logic…and step away from the critical-importance machine. It’s really not worth all that tension in your body. Your health and well-being are of much greater long-term importance. Give it up! Don’t take yes for an answer. The answer at this moment is no: no to working harder, no to figuring it out, no to breaking necks and backs to force a result. Don’t give up, but do give up the struggle. This isn’t the way to the peaceful, playful and purposeful person you choose to be. Accept that you have the right to take a contrary action for the health and well-being of everyone. Just laugh all over yourself. Find something to do that breaks the rigid, clenched jaw. Getting into the practice of laughing in the face of your moments of all-importance could be the best habit to bring into a Back Forty of contribution. And a good laugh is always a contribution to everyone. We re-did our first broadcast because the first version has poor sound quality since I was out of the office with low bandwidth. If you’re still intrigued, watch the original version below, you’ll be able to handle the sound quality! 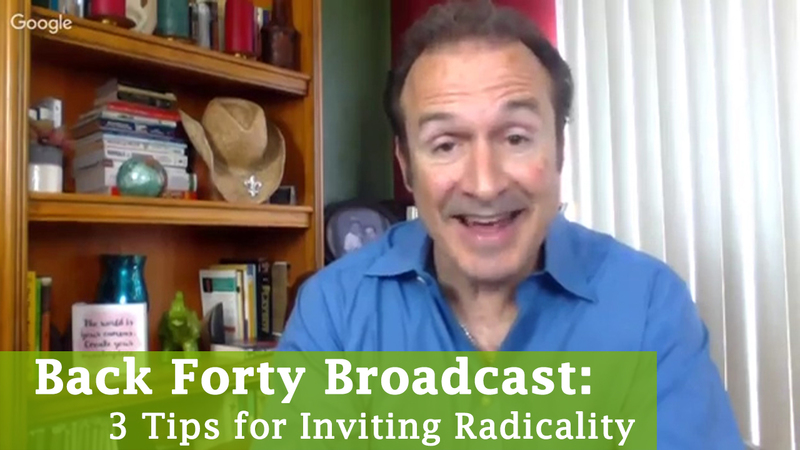 The term “radical” can raise our antennae and suspicions. It carries the energy of dramatic shift, and implies extremes. Yet, the idea of extremities is only the word’s secondary definition. The primary definition is about going to the root of something, a fundamental shift. Radical Forgiveness, Radical Happiness, Radical Restarts…all imply a going deeper than the surface norm by getting to the core of the thing itself. To impact the drift of life often requires a radical wake-up, because it’s just too easy to stick to the norm. You hear of folks who took on whole new ways of living after sudden health scares, near-death experiences, etc. The question is: do we need to wait for such an external wake-up? I like the idea of fomenting a crisis proactively, meaning self-inflicting the urgency for shift before the shift hits the fan. What if you knew (or could make yourself believe) that your body was about to give out next week for lack of care? How would your diet, fitness and sleep program look this week? Alexandra and I recently looked at the logic-of-the-moment vs the generally-accepted-wisdom around sleep. In the moment, there simply seems to be no choice but to get less sleep so that “everything can get done.” Yet, there’s the joke itself: everything will NEVER get done! And, allowing that thought pattern to continue – with sleep taking the hit from overzealous engagement – means that bodily rest becomes the red-headed, disregarded stepchild. The generally accepted wisdom today, touted by many inspirational leaders and health experts, is that 7 hours is the minimum of sleep we need…for a boatload of reasons. So, the facts are in, and it’s just the question of “in the moment” whether we can go against our skewed logic and trust the facts. Who knows how much more alert, acute and astute we may become with solid nights of sleep under our belts? So, we’ve taken on a commitment to our second half/best half of life including what seems like illogical sleep habits because if, as we say in The Back Forty, “we have yet to do what we came here to do”, we need the healthy bodies required to house the spirits to do that! What if you knew (or could make yourself believe) that this job you’ve been hating will definitely end in a month? How would your career change efforts look then? What if you knew (or could make yourself believe) that something is brewing under the surface with your mate that will have him/her leave soon? How would your efforts to communicate alter immediately? What if you knew (or could make yourself believe) that your croaking was imminent, definitely within the year? What bucket list items or purpose fulfillment would you take on right now? Consider this an invitation to look into your own life and foment your own crisis. It’s a real opportunity to put yourself in the driver’s seat of The Back Forty kind of life you want to live. Here’s a few easy steps you can take to create some radical change in your own life. Start with one thing, and then apply it to others after you’ve had success. Identify an area you’ve been nattering about, something you say you want to change but it keeps on keeping on just as it is. Is it your work? Is it a relationship issue (either inside of one or wanting one)? Is it that “thing” you keep saying you’ll do – write the book, devote time to that charity, schedule a vacation, take that course? Whatever it is, just find the top, most juicy thing you’re very logically convinced can’t happen yet. Now, of course, I don’t mean to really kill yourself, but in your mind. Consider that it’s all over now. Whatever you considered so important and critical that you simply couldn’t do that “thing”…all those reasons are now gone. You exited the planet. Maybe you exited without having done that “thing”. How does that feel? Maybe you exited the planet BECAUSE you didn’t do that “thing”? How does that feel? Whoa! You just had a near-death experience! How radical was that? Did you see light? Did you start through a tunnel? Did you hover over your body a while inside a peaceful state of ease and grace? Well, whatever your experience, you’re back…back in this body, back in this life, and back with all of the same stuff and challenges and opportunities you left with. What will you do about that “thing” now? Consider that it’s time to get radical! Yes, you have all the time in the world…and yet not a moment to waste! Frank Sinatra sings “The best is yet to come and, babe, won’t it be fine.” Let’s make Frankie right, ok?